Shevai or rice noodles is one of the most common breakfast in GSB household. It seems in earlier days when guests used to stay longer than hosts expected to shevai was prepared. Since shevai is made by pressing into the the maker and pushing it out guests were also given a hint that it was time for them to push themselves out. We still laugh on this when we make shevai at home. 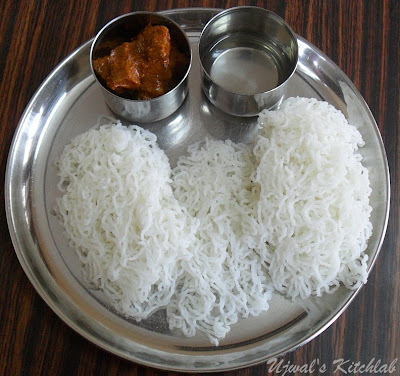 Normally shevai is made by soaking rice and then grinding it along with freshly grated coconut. The mixture is then stirred continuously on medium flame until it turns into solid mass until it is non sticky. I will share the traditional recipe next time. Here is an instant version of Shevai that my sister-in-law's mom shared with us. She is an excellent cook who loves to try a variety of dishes and always has something new to share. This version of shevai does not call for soaking rice or grated coconut. 1) Mix all the ingredients in a thick bottomed kadhai or vessel. Keep on medium flame and keep stirring continuously it thickens. To check if it is done dip your finger into cool water and touch the mixture. If it does not stick to your hand then it is ready. Switch off. 2) When hot make balls of the size of an orange and steam it. Once done fork inserted should come out clean. 3) Add 1 or 2 balls (as per the capacity of your shevai press) and press onto a clean plate. Transfer to a bigger tray lined with wet clean muslin cloth. This is to prevent the shevai from drying up. Repeat until all the balls are used up. 1) Shevai can be served with pickle and coconut oil. (I used tender jackfruit pickle in the picture above and coconut oil). 2) Kids love powdered shevai ( slightly crush using your hands) with ghee and sugar. 3) It can also be served with daLithoy. 4) Goes well with Potato song or any spicy side dish. 5) Upma can be made with leftover shevai.